"Only a moron would bring a sword to a gun fight." Some fights have rules. Most don't. However, a lot of people will still fight as though there are rules. The Combat Pragmatist is a character who is defined by his or her willingness to do anything in a fight to win. This typically applies to "real" fights where there's actually something at stake that's more important than a cash prize, a trophy, or a title belt, and usually not professional fights in a controlled environment where safeguards are in place to prevent one side from suffering too much damage and where one can be disqualified for not abiding by the rules. In such settings, the Combat Pragmatist is an unsympathetic character (usually the main antagonist) who shows through his ruthlessness that he honors nothing — not his opponents, not the sport and its customs, not the tournament's sacred history — but winning. These characters are characterized by an extensive knowledge of tactics others may consider "dirty" fighting or just by a willingness to use those tactics to achieve their goal, often against more "honorable" opponents (i.e. Genre Blind ones). They are likely to think of any adherence to rules or sporting combat as Honor Before Reason. They do not suffer from a Complexity Addiction, are never afraid to use a Mundane Solution (nor do they need it to be pointed out to them), never assume that the other person will fight "honorably", have no interest in a Self-Imposed Challenge, don't care if their opponent is a worthy one, and will not hesitate to Kick Them While They Are Down. They almost always have their weapon of choice either on them or near them at all times, and possibly a spare or two. If not, they're willing to use absolutely anything as a weapon and only resort to Good Old Fisticuffs if there's no weapon nearby. They will not hesitate to use a Dangerous Forbidden Technique. They have no compunction about hurting a child. Or about attacking someone from behind. Or throwing sand in their eyes. Or pulling down their pants (or flipping up their skirts if dealing with women or a kilt-wearing man). Or the "Hey, You!" Haymaker. Or biting them. Or using Weighted Gloves. Or a Groin Attack. Or pretending to surrender. Or... well, you get the idea. However, there can be different levels of this. Even those who don't believe in fighting fair may still have lines they won't cross, such as refusing to kill or not hurting anyone who's not already part of the fight. Often overlaps with the No-Nonsense Nemesis, Anti Heroes, and especially Ninja. They almost never allow honor or sentiment to cloud their judgement, will usually take measures to avoid setbacks, or betrayal.. Sometimes Weak, but Skilled or Too Clever by Half, though the truly pragmatic former will constantly seek to increase his power level and hence advantage over his enemies. It can look like Confusion Fu in practice — but it almost always isn't. If The Unfettered fights, then he'll be one of these. This can be an Establishing Character Moment. It can also be divisive, both among the audience and In-Universe, due to Moral Myopia — the hero is a resourceful badass, while the villain is just a dirty cheater. This can lead to instances of Black and Gray Morality, showing that the hero and the villain are Not So Different, and the difference between someone being a terrorist or a freedom fighter. For heroes, it's possible for these tactics, if extreme enough, to lead to What the Hell, Hero? moments or claims of If You Kill Him, You Will Be Just Like Him, sometimes resulting in responses of I Did What I Had to Do, and in extreme cases, can be a metaphor for Slowly Slipping Into Evil that represents the start or conclusion of a FaceHeel Turn. Villains can also be pragmatic, though it usually takes on a different form. Villains being normal Combat Pragmatists is usually averted, or at least not played out completely straight, as it can possibly even lead to them being victorious. If they are, it means they avert Bond Villain Stupidity and actually kill the hero instead of having dinner with him. Depending on the context, using these tactics can be their Kick the Dog moment or even their crossing of the Moral Event Horizon. Characters are often deliberately not put into this trope due to Rule of Cool. If everyone took this approach to combat who could, key characters would be dead or defeated too soon and the story would be over a little too quickly. Plus, it's often just way cooler to show off more complicated tactics than simple ones. Additionally, Moral Guardians and Media Watchdogs sometimes make having this type of character difficult by ensuring that they can't do certain actions. 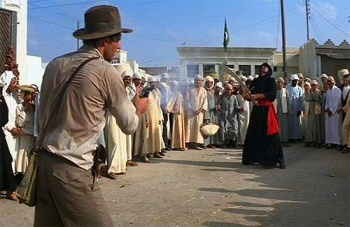 On the other hand, when drawn-out straight fights are impractical, excitement can be created by Genre Shift away from pure action to espionage, planning, intrigue and the thrill of the hunt, with clever heroes and villains alike who avoid the Idiot Ball and unnecessary flash, and any open violence being quick and decisive, however, this character can come as a Family-Unfriendly Aesop that is right, "Cheating in a fight with no rules is not cheating" and "If you want to defeat the bad guys, you don't have to fight fair with them". The Obligatory War-Crime Scene is a related trope. Not to be confused with Why Don't You Just Shoot Him? (although often is a subversion of that trope).